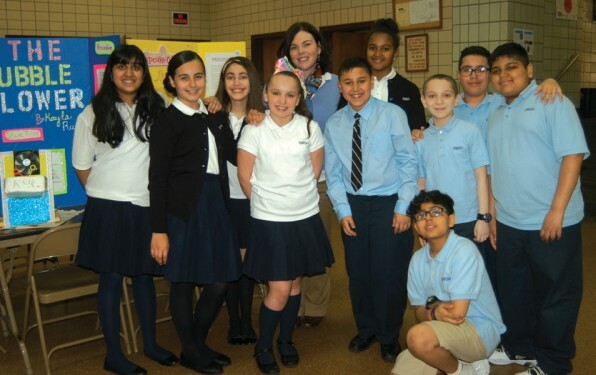 Sixth graders at St. Mary Gate of Heaven School, Ozone Park, are joining the ranks of countless inventors who have found creative ways to make life a little easier – or at least more whimsical. 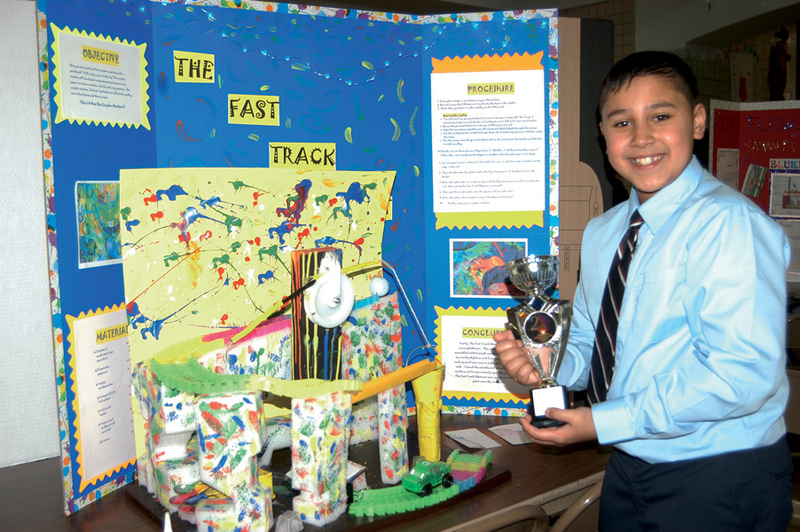 A cupcake decorator, egg cracker, paint launcher and humane mousetrap are among the more than 60 inventions students presented at the school’s first Invention Convention in the school auditorium. 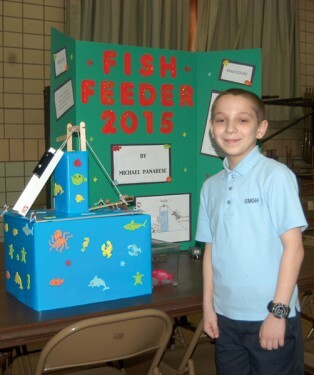 Following a unit in science class on simple and complex machines, students in all three sixth-grade classes spent two months dreaming up and designing their own machines. 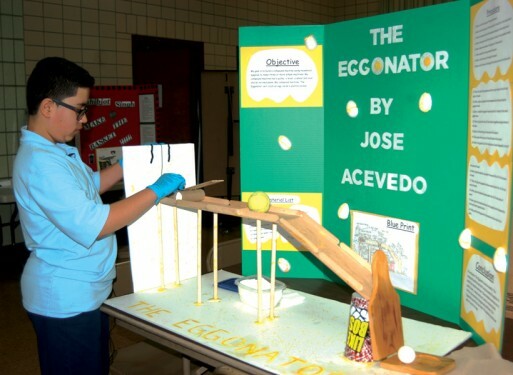 For Jose Acevedo, that meant creating “The Eggonator,” an egg-cracking device using household materials. 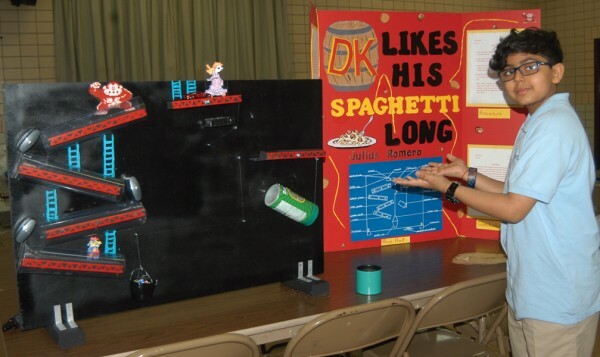 Standing before his device, Acevedo puts it into motion by lifting a string to release a toy car, which slides down a ruler balanced on a toilet-paper tube and onto a wooden track. The car then hits a Popsicle stick into a tennis ball, which slides down a track and pushes closed a wooden plantain press, gently cracking the egg inside. Things didn’t go as smoothly for Jonathan Ruano when he was designing “The Fast Track Abstract,” a device to make abstract splatter paintings that might have turned Jackson Pollock’s head. Ruano’s project propels a golf ball down a racetrack and into a bucket, triggering a pulley system that launches paint from three plastic spoons onto a small canvas. A few adjustments later and he was producing one unique piece of art after another. “In art class, I started seeing different kinds of paintings, like Van Gogh’s ‘The Starry Night,’ so I said, ‘What if I make a complex machine that involves art,’” he said. Ruano’s invention earned him a second-place award at the convention, and Acevedo won third. First place went to Nicole Morales for creating a humane mousetrap. 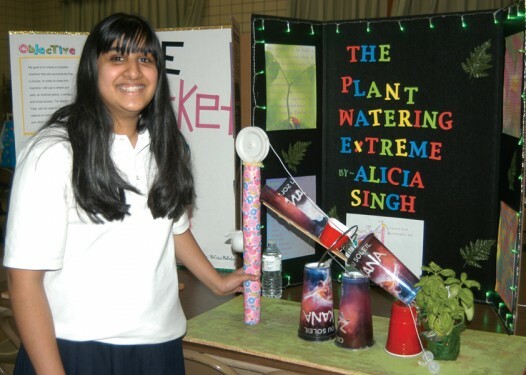 Recognition was given to inventions that were creative, combined several simple machines and worked consistently. Alongside each invention was a display detailing the student’s invention process, from the objective, materials and blueprint, to the procedure and conclusion. The projects are currently on display throughout the school building. Sorriero kept students on track by setting deadlines for each step of the process so she could help them identify any flaws and find solutions. “It was nice to see them go through the process, to see how it feels when it doesn’t work and then go back, revise and edit,” she said. 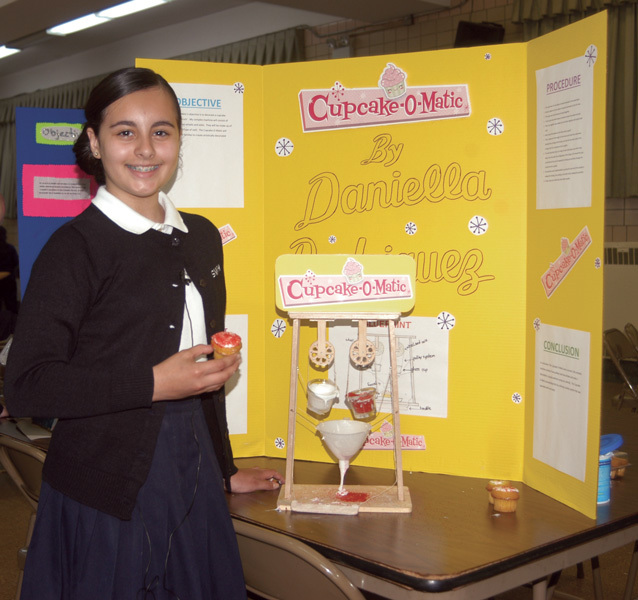 A love of baking inspired Daniella Rodriguez’ “Cupcake-O-Matic” machine, which “decorates a cupcake without any utensils,” she said. She demonstrated by placing a mini-cupcake under the device, which employs two wheels and axles and a pulley system to pour frosting and sprinkles from glass cups into a funnel directly over the cake. “My biggest challenge was trying to get everything so precise,” she said, noting that it took six days and about 60 mini-cupcakes to fine-tune her project. “It wasn’t easy, but I learned that I can do anything if I put my mind to it,” she said. 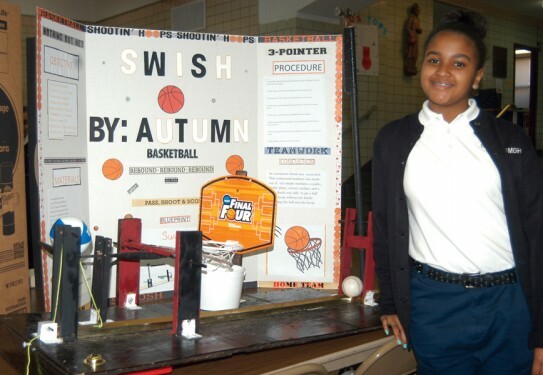 Reflecting the trend toward careers in science, technology, engineering and mathematics (STEM), Sorriero said sixth graders have expressed interest in going to math- and science-focused high schools. That is exactly how Ruano feels when he looks at his invention.